How can I see how active my Tribemates have been recently? See at a glance the activity levels of your Tribe members with Tribe Activity Indicators. 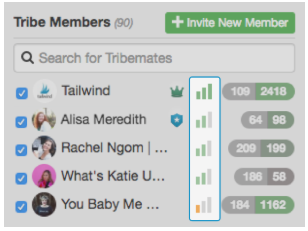 You can quickly gauge which Tribemates have been recently active and which ones need a little encouragement to share more content by checking out the Activity Indicators in your Tribe Members list. To the right of each of your Tribemate's names you can check Tribe Activity Indicators to see who has been active recently, and who might need a reminder to share more content. Send a quick message to recently-active Tribemates via Tribes chat to thank them for their contributions. Reach out to Tribemates who haven’t shared in a while to start a conversation and remind them of all the fresh content that’s waiting to be shared. Tribe Members can only see their Activity Rating for their own account, but Tribe Owners and Tribe Admins can see Activity Ratings for everyone in their Tribe.